I am sitting here just after Christmas Day, in the early morning of the 26th of December. Christmas is hyped up by everyone and everything, seems like after Memorial Day, and now it is mostly all over. All over except for all the stores that will be hounded by returns tomorrow and the week to follow! Ha, good luck dad! Even though I did very little shopping, cooking or traveling, I am tired and wore out from the holidays. It has been a good Christmas, I am very blessed by the family I have and all the love they show. I always receive more gifts than I need or ask for and I am very grateful for it all. Thank you. The past week of running has been very good to me. Today, well technically yesterday now, I did my annual 10 miles on Christmas. Seems like I always run 10 miles on Christmas. The run was sluggish because I had to squeeze it in between a huge breakfast (and 5 too many cookies) and going to family houses. I felt like I was 100 pounds overweight! HAHA. But really, I did weigh 10 pounds more than normal after all the dinners! The run was good all in all. The previous days runs were great. I have been trying to run as much as possible (without being too extreme!). Monday, I ended up running 16 miles, having no clue how many I was planning on running. It was all in the dark, with very little traffic on the county roads here in Meigs. The night was calm and clear. My legs are sore, but it was nice to get a long run in before I do the Frozen Sasquatch 25k on January 2nd. The next few days were spent mostly on the trails at Strouds Run. I explored some new trails parallel with E. State Street and discovered new views, rock formations, ponds, and adventures. Strouds Run is quickly becoming one of my favorite places to run, I am now familiar with every trail in the forest. I still have not created my goals for the winter/spring season for myself yet. I have thought about it a little and will soon be posting all my collective thoughts soon. I like writing everything I think, or else I would forget about it within days. My mind will move on to new things! I hope everyone had a great Christmas, God Bless. This weekend, I traveled to Portsmouth to chill with some cool people and eat a lot of good food. Friday, I got to Portsmouth and ran 8 miles with a couple of recruits from Circleville, Brad Liston and Brad Kline. I hope we get both of them, Liston would help our team right off the bat. That evening we all went to the Italian Restaurant on Gallia St. I had Shrimp Alfredo, it was very good! Then, this morning, we woke up to run again. I stayed at Blakes house, as did Eric Holbrock. We had fresh bread from Kroger with honey drizzled on it, washed down with free Sunny D. That is always a good pre-run meal to get some energy, plus it is delicious! The run went well, it was in the snow mostly; last night it snowed quite a bit. So, we were all cold and wet when we got back to the apartment. Luckily, Blake quickly had Vanilla Lattes ready for us. Nothing like a little get-up after a cold run. After that, all of the guys in town were invited over to Eric and Krista's house for brunch. She had fresh baked Blueberry Muffins for us and they were fantastic. She also made French Toast, one of my favorite breakfast foods ever! Krista is a great cook and I have been blessed to have had so many meals from her. One advantage of being a Bear. After a bit, Blake Wysocki decided to fix up a meal. It was a good one. 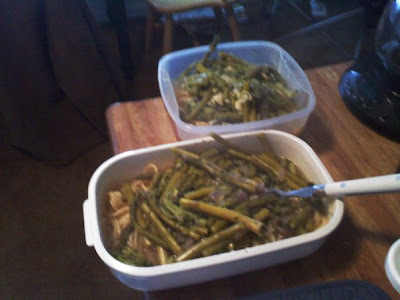 He boiled Asparagus and Broccoli in chicken broth with garlic cloves and red onions, then poured that over some pasta. This was a good late lunch, especially since the meal totaled no more than $3 and could feed 4 people easily! The meal was dubbed Green Goop by the chef himself, and rightly so. A nice melting taste of vegetables and garlic is matched by no other. This has been my past two days! Hopefully mom will make a nice home cooked meal tomorrow after church! That would end the weekend perfectly! Now, I am off to enjoy some fresh baked Cinnamon Rolls! I haven't posted on here since last Wednesday, so it has been a week now. Since then, I have traveled home and began my Christmas break. Not much has went on and I am enjoying the ease of living, without homework to do and work to be at. I have slept a lot, ran a good bit, and visited family and friends. This is my type of living, although I do think a person needs activity and work to consume the day. It is just nice to have a month break. My life has been busy since the start of August and this is the first break I have had! Running has benefited the most from all of this. I never got the running schedule Eric handed out, but I didn't want it anyway. I like to just be "free" and run whatever I feel like, especially during a break like this. Everyday during this break, I have went out planning on doing a certain amount of miles and have ended up doing more than planned. I guess that is better than doing less, right? I have also limited running on concrete. I do not think I have ran more than 50 steps on a hard surface for two weeks! And my legs are loving it! Without hard surfaces and hard workouts, my legs feel great, even with a large jump in mileage. Plus, I am able to run my training runs a little quicker, and I have enjoyed running faster than normal on trails. That's what I have been doing. Today and yesterday, I drove to Athens and ran at Strouds Run. This park has the nicest trails close to my home. Yesterday I found a new trail that was all single track. It was very well kept and the footing was great. I also saw a lot of bike tracks on it, it is good t see it getting some use. I hope this trail doesn't get too overgrown over the summer. 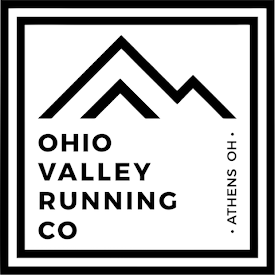 Since I plan on getting an internship in Athens, most of my running will be here, and I hope the trails are nice with the growth season as it is right now. Today I ran on a familiar trail there. I like this one a lot. It winds in and out of rocks, evergreen tree's, and in and out of little gulley's with a lot of switchback and soft needle packed single track trails! It was great today because I ran hard and felt good. At the end of my run I found a new trail and started up it. I decided to turn around since it was getting dark. I will investigate this trail next time I am at Strouds Run, which will be tomorrow more than likely! That is about it for now. I have ran 10 miles everyday this week and am feeling great! I didn't feel like going from 30 to 35 and so on like the running books say. The best part about my summer and fall base mileage is that it will be with me for the rest of my life! I learned the ropes of 100 mile weeks and now my legs know the feeling of running that type of mileage and won't be surprised when I jump up in mileage! I am truly Running Free! Greatest Run in My Life! Wow, this run was amazing. Reece and I went out and parked past Camp Oyo, where Hobey Hollow Bridle Trail intersected. The trail led us up a muddy and wet path. We crossed several creeks that were gushing with water. After a ways into the run, we started climbing a monster hill and it took forever to get up it! At the top we came to SF road #6 and we turned left. We passed by the Fire Tower and I wanted to see how far the 40 mile loop trail was. We got to it shortly and turned right on that to see if that was the trail we ran Monday. Sure enough, it was. So, we turned around and crossed road #6 onto the other side of the trail. This pretty much made a huge shortcut to Hobey Hollow as we were there in no time after a huge downhill. We decided to cross Hobey Hollow and head up the hill on the 40 mile trail a little longer. We ran another monster hill up that trail and come to a crossing with Rock Lick Bridle trail where there was a nice camp site. We turned around and headed back to the car on Hobey Hollow. Everything we ran today was fresh dirt for us. It was awesome not knowing where we were heading and then popping out on a trail we recognized or could envision from the map. We climbed huge hills and made huge descents. We crossed creeks and got really muddy. In the words of Reece Brown, "We are badasses!" And this was done all within 20 miles of Shawnee State! To have the resources and abundance of trails and forest is just amazing. We really felt like this is the way to run. To slosh around the creek and muddy trail does something that no other type of running does. I think the combination of finishing up school and being able to go back home made this run good. I am thankful to have a great friend like Reece Brown who will go out and run these trails with me. It is better to share such an amazing experience like today with a great friend. We are brothers. Brother Bears. Now it is time to enjoy a nice cup of tea! Tonight, about 1 hour ago, I finished my last test of the year. I had a take-home final in Civilization and Literature. As soon as I turn the test into my professor tomorrow, my semester is finished. This class was my hardest class of the year in my opinion. After my first few tests and assignments my goal was to just get a C in the class. Usually I would be unsatisfied with a C but in this class that was going to be alright with me. But, as the assignments started being worth more and I started trying harder, my grades quickly improved and now I am thinking a B is a for sure lock in the class. Besides that, I think I will have an A in the rest of my classes! Which is good by me! My last two days of running have been fantastic. I experience something new in both of the runs. First, Monday: Reece and I drove out to the forest and parked in the parking lot right off of 125. He wanted to the the trail that is off to the left, and I was really excited to get on this thing. This is my favorite trail at the forest and in my opinion, the hardest but most beneficial. I mean, this trail is so tough it put Shane Meyer on the ground and I had never saw him fall! There are uphills, downhills, switchbacks, technical running, creek-bed running, water crossings, and much more. How could any trail be better? As I was saying about the run being a new experience.... as we turned around and headed back, the sun started faded and the trail got dimmer and dimmer every minute. By the time we had ten minutes left, the trail was really dark and we would hardly see our footing. This was great though! I had read about people who turn their headlamps off during a night trail run and let their feet get a feel for the trail. When the light was gone, I felt like that was when my footing was the greatest. I was making a great connection with the trail that would of never happened in the daylight. This run was amazing! Today was another new experience. I decided to drive out to the forest and run trails again. This time I ran in Vibram Five Finger shoes. I have ran a few runs in these but never on trails. I had a blast doing it! I decided to stay on a nicer trail since I didn't know how these things would feel with rocks, roots, and the works. The only problem I had today was some slick uphills. But, it had been raining like crazy all day and it was really muddy. I don't think trail shoes would of got traction either. Regardless, I like the feeling and will more than likely do more runs with these shoes. Time to pack up, head home, and get some nice training in over Christmas break. I will be riding my bike and hitting the trails a lot. I can't wait to run a long trail race on January 2nd as I prepare for a new semester. In a week or so, I will know my final grades and I will be posting me new goals for Winter/Spring! Whenever I take some time off, I usually get a little antsy to get back at it in a few days. But, this time it was not the case. I think I just needed a little mental break from the tough season. Until two Sundays ago, I had run everyday since May 6th, so almost 8 months. Not only was this the longest stretch without a day off in my life, it was at a much higher level of running, with 21 straight weeks over 70 miles and a couple over 100. I probably averaged 25 miles a week more than last season! Also, competition takes a toll mentally. Every other week I would have to prepare myself for a big race. Sometimes it is hard for me to get into a competitive spirit. Now there is no competing and just running. I am Running Free once again and this is what I love about running. Workouts and intervals aren't as fun and free as a long trail run in the forest. That is my view at least. That is what running this winter will be all about for me. Relaxing runs, trail runs, barefoot runs, and isolation away from competition! Today I ran 6 miles in my Vibram Five Finger shoes. My last few runs have been with these or either completely barefoot. It is amazing how much different my form feels when I don't have an inch of foam causing my heel to strike the ground first. My back is straighter, my stride is shorter, and I am working my feet muscles to prevent them from getting weak! This will prevent any injury that even thinks about coming into my legs! I felt really good on the run. I do not think I lost much fitness. Biking the past week let me still work my lungs. Thursday I had a nice ride with my good friends Ken Shonkwiler and Dirk Kostoff. Dirk did the entire 24 miles on a single speed bike and stayed with Ken and I pretty well. This was my first ride with more than one person. I had never understood the ability to draft in biking until then. It is so much easy to sit behind someone. We all took turns cutting the wind. I am planning on a longer ride tomorrow morning. After a very nice and much needed Thanksgiving Break, I am hitting the books real hard this week. Luckily though, school is winding down and there is not much homework to do, just a ton of studying. I have six more tests/final projects still left to do; I will be finished by next Wednesday. Christmas Break could not arrive any sooner! Through it all, I have had a good semester and even though I have been studying a lot lately, I have stayed calm and stress-free, which is great. As for training right now, I haven't ran a step in 4 days. Saturday, I raced the Brandi Thomas, Keep Your Fork 5k and had a great time. I talked to some people that I only talk to once a year (at this race) and got caught up on all the happenings around Meigs County. It was nice to run a few miles with Fogle on my cool down. He is the man that introduced running to me! Without any time on my feet, I have had a lot of free time during the later part of the day. Monday and Tuesday I rode my bike, 30 miles on Monday and 10 Tuesday. So, I am still keeping active. I plan on going on more rides all winter. Well, I have to get back to studying!